Alen air purifiers are also highly recommended because of the customizable option to make the appearance of the device suitable for your homes. Global warming and climate changes have created havoc in nature. The outdoor pollution is bad enough, add in the smoke from the recent fire or smoke from mishaps, things get worse. It is also a fact that the air quality changes from time to time and at different times, the major air pollutant might be different. At this time, it is not possible to have different types of air purifiers to suit the requirement. Alen air purifiers are here to the rescue. Alen air purifiers can accommodate different types of filters that can be easily changed from one to another, as required. You can have as many as over 10 choices with these purifiers. Alen air purifiers are flexible for purchase where you can mix and match most of the purifiers with your choice of the air filter from the lot. You will also be able to customize the front panel of the device so that it matches your home décor. Gone are the days where you will be seeing the plain old white or black air purifiers, standing oddly at one spot of the room. These customized Alen air purifiers would easily blend with the décor colors. There are different types of air filters that are used for 7 different purposes. Filtering: Each Alen air purifier uses 3 layers of filtering that has the pre-filter catching the larger particles, followed by the HEPA filter for the general cleansing of air and removing finer particles. The third layer is the specific type of filter for thorough air purification. The payment is flexible so that you don’t have to pay the amount all at once. The Alen air purifier price can be paid in 12 installments over the year. There is also no interest for these installments. The products are shipped fast and delivered faster. The shipment is done free of cost. The products come with a 60-day satisfaction guarantee and a limited lifetime warranty as well. Then there are the 5 major types of Alen air purifiers. Of the 5 purifiers, 4 of them can have 4 different choices. To be elaborate, this is the Alen BreatheSmart HEPA air purifier with a white cover that comes by default. Alen BreatheSmart air purifier white is fully customizable from the front panel to the filter options. There are 14 color choices for the front panel and 4 options for the air filter. The device has the automatic smart sensors and works rather quiet. The sensor detects the air quality and adjusts the fan speed for more or lesser air cleansing as required. The sensor changes its color from blue, pink and red as the pollutant amount changes. It is also the air purifier with largest coverage area. The coverage area is a maximum of 1100 sq ft. The air purifier is child safe as it has a child lock panel and a child safe vent guard. The Alen air purifier ionizer charges the air particles for easy filtration. This ensures that no stray particles are floating in the air when the device is switched on. The Alen air purifier clean indicator blinks when the filter life is about to expire. When this light blinks, get the new filter and follow the instructions given in the Alen air purifier manual for the relevant model. All the filters have HEPA filter on it, with some additional features making it more suitable for the purpose chosen. The air purifier models are named after the filter choice that it comes with. Alen BreatheSmart air purifier with HEPA pure: This is used to eliminate the common air pollutants like dust, allergens, and asthma causing particles from the air. This is the basic filter that any home needs. Alen BreatheSmart air purifier with HEPA silver filter is used for finer filtering with the help of silver carbon technology. This helps eliminate the molds and mildew spores, bacteria etc creating a complete allergy and asthma free environment. Alen BreatheSmart air purifier with HEPA Freshplus filter is to freshen up the indoor air with no allergens, odors, smoke, and chemicals. This filter specifically attends to the concern of the volatile organic compounds in the air. Alen BreatheSmart air purifier with HEPAodorcell filter is mainly used to eliminate odor from the indoor air. It removes the pet odors, diaper odor and even the cooking smell from the indoor air. It effectively tackles the other allergens, dust and air particles as well. The power consumption is 105 watts at the highest speed. The dimension of the air purifier is 17.75 x 26.75 x 10 inches. The weight of this device is 21 lbs. Coverage: The Alen FIT50 air purifier is the second largest covering purifier from this brand. The maximum coverage for this air purifier is 900 sqft which is about the size of an average living room in most homes. Filter: The default filter that this model comes with is the allergy and dust filter- HEPA pure. IT also has the other 4 types of filter options to suit your home- HEPA Pure, HEPA silver, HEPA Freshplus and HEPA Odorcell. Here, the filter is expected to last for about 10-12 months. Other features: It also has the automatic working mode and a smart sensor for the smart working of the device. There is the ionizer that ensures that the air particles are duly attracted to the HEPA filter, a filter life indicator which is nothing short of a life saver, timer and all the major features that are expected in the BreatheSmart air purifier. Specifications: Power usage would be 60 watts at maximum. The dimensions of this device are 16.75 x 22.25 x 10 inches and a weight of 16 lbs. Alen BreatheSmart Flex air purifier is the little brother in this family. The coverage area is lesser at 700 sq ft and it also lacks a few key features. The BreatheSmart Flex air purifier has the filter life indicator, a timer, the fan speed buttons, child lock and a handle to move the device. There is no sensor or ionizer. This is just a plain and decent air purifier. It still has the options for the front panel with all the 14 choices as well as the filter option for the right kind of usage. You may choose from the HEPA Pure, HEPA Silver, HEPA Freshplus and HEPA Odorcell filters. The fan works on 4 speeds and it utilizes about 36 watts at the highest speed. The filter expectancy is lower at 6-9 months. Even the size is smaller at 25 x 15 x 8.5 inches and weighs just 15 lbs. The Alen air purifier Paralda is a tower-like structure that is suitable for the smaller rooms. The air outlet is present on both sides of the tower. It is one stylish structure that is ideal for space saving and provides pure air to breathe. IT can clean the air in a room that has a maximum size of 500 sq ft. This tower air purifier is portable and contains ionizer facility for the maximum effectiveness by the HEPA filter. It is a miniature version of the Alen air purifiers with all the key features. It has a timer installed in it as well. The product comes with the HEPA-Silver filter. You can have the other types of filters as the replacement options. The replacement filters available are HEPA-Pure, HEPA-Silver, HEPA-Freshplus, and HEPA-Odorcell. These filters have the washable pre-filter and a 2 stages filtration option inside. It has the filter indicator attached that will let you know how the filter is doing and when it is time for the replacement. Usually, the filter lasts for 6-9 months on average. The air purifier uses 4 fan speeds and the maximum power utilization is 56 watts. It mostly works on 110V. The size of the Alen air purifier Paralda is 7 x 28 x 11 inches. The device weighs about 15 lbs. It is portable and can have programmed controls. All the programming and the filter replacement instructions are given in the Alen Paralda air purifier manual which you will get along with the product. If not, you can place a request to get the same from the makers or download it online. 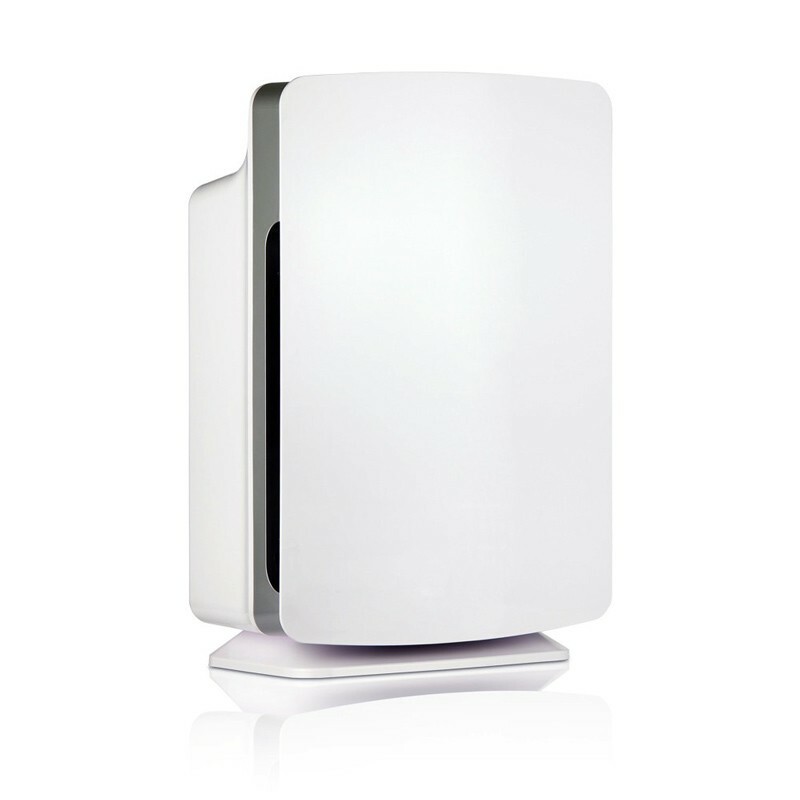 Alen air purifier T500 is a small footprint HEPA air purifier. It is available in multiple (12) designer colors to have the perfect addition to your home. Alen T500 tower air purifier black is the basic color or you may choose the white. The color options are for the side trim. Alen T500 is also known as the Alen T500 traveler air purifiers because of its smaller size and portability. There is an option to add the carry bag with the product so that you can take it with your anywhere. It is light weight and can set u fast. It covers a room for 500 sq ft. The working of this air purifier is powerful and stays quiet. The LCD panel displays the intuitive controls. The timer allows it to run for a maximum of 12 hours at a time. The filter life is about 6-12 months. The filter indicator light lets you know when you need to change it. The purifier works on 3 fan speeds and the highest setting uses up to 53 watts of power. It is a compact air purifier that does not take much space or power to work. The size and weight of the Alen T500 air purifier are 22 x 6 x 10 inches and 9 lbs respectively. Alen T500 air purifier reviews show that the sleek look, quiet working, powerful air purification and smaller occupancy are the main reasons why people love this air purifier. They say it is easy to clean and to use. The change in the air is noticed almost right away. Apaprt from these above mentioned models. Alen air purifiers were also available in other model names. Alen A375 air purifier, Alen air purifier T300, Alen air purifier T100and Alen A350 air purifier sale is stopped. You may no longer be able to buy these models. But for those, who already have them can still buy the replacement filters, all the options. Alen 350 and Alen 375 are the base models ofr the BreatheSmart series with smart sensors, ionizer and UV technology. The Alen T300 is the UV lamp addition model while the other is the Alen T100 desktop air purifiers. All the Alen air purifier replacement filters are available directly from the makers or from other Alen air purifier dealers online. It is available on Amazon, eBay and from other online stores. Alen air purifier- Where to buy? Alen air purifier stores are available only online. It is available in most International countries like UK, UV, USA, UAE, Singapore, Shanghai, Philippines, Malaysia, Indonesia, Canada, India, Dubai, Beijing- China, Australia etc. So, who sells Alen air purifiers? You can find them from Amazon, eBay, Home Depot etc. You may apply the Alen air purifier discount codes that are available for most of the model types. Apply these codes while you checkout. The discount codes enable you to get discount on the purchased item or get additional discount on the additional item etc. The best place to get these discounts is from the Alen Corp. Not all the other Alen air purifier retailers may have this option. Other than the obvious discount codes, you can also get better deals when purchasing the smart bundle of the Alen air purifiers. The Smart bundle is a pack of air purifiers and their filters as a package that is available at a cheaper rate than you would when you get them separately. These Smart bundle options are available for all Alen air purifier models. When the title says just the smart bundle as in the case of Alen T500 Smart Bundle or Alen BreateSmart FLEX Smart bundle, you will be getting 1 air purifier with 2 filters. When the title of the offer says 2-Pack Smart Bundle, you almost hit a jackpot. You will be getting 2 air purifiers and 4 filters in the same bundle. You would still be able to apply the designer panel option wherever applicable. The only catch here is that, there is no mix n match option here. You will be getting the same type of air purifiers in each bundle. The Alen air purifier’s price starts from the highest $599 to the lowest at $249. The highend model contains all the smart features to have thorough air scrubbing. Adding the option for a customized version and a monthly installment with no interest rate if interested, the Alen air purifier price is not at all high. You will have to pay for the similar price for other brands but you may not get all the facilities there. Moreover, the ultimate aim is to get pure air to breathe and Alen air purifiers have proven its worth in this field. Paying the price is all worthy and comes only as the second. Any common problem with the working of the Alen air purifiers can be easily rectified with a few adjustments of hitting the buttons. The basic Alen air purifier troubleshooting is explained in the Alen air purifier manual. You can refer to the relevant user manual to get the details. You can always contact the customer care if you are unable to go through the troubleshooting. The Alen air purifier reviews show that these products are easy to use, convenient with the filter indicator and sophisticated for the smart sensor equipped models. The users say that the quiet operation of the device makes you forget that it is even working. Alen air purifiers may be modern and sophisticated, but the fewer buttons make the life easier for the users. You don’t have to worry about hitting the wrong button. The customize option is the biggest advantage here. That coupled with the good air purification for all the purposes intended, Alen air purifiers are a sure bet to stay in the market for a while. It truly makes your money spent worth of every penny.